With another righteous (and likely last) ParTay gathering in the books, it was time to point the Nightowl east towards home. Just how to get there, however, is a more complicated matter. I’m almost on the west coast in Shelton, WA and I live in Ann Arbor, MI. I have up to eight travel days with which to meander my way back home before I put away my superhero biker costume and become another working class dog waiting for the next opportunity for a cross-country ride. Truth be told, I’ve done this ride in as few as three days (731 miles, 846 miles, 804 miles), but this year I have no need to race home. Starting from Washington, there are four decent routes across the state (WA20, US2, I90, US12) and the permutations of possible routes goes up exponentially from there. I could take a run through Glacier National Park, but it’s closed after a nearby wildfire. I could head for Clarkston, WA / Lewiston, ID and take Lolo pass into Montana. Or, I could wring out one more day of visiting with west-coast friends and head north across the Canadian Border and stay with my friends in Vancouver. Then I could head east and revisit some of the mountain roads that we explored during the “Run to the Sun” rides that we had back in the late 1990’s . As if I hadn’t already had enough of US101, I got right back on it to ride up to the Port Townsend / Whidbey Island ferry. First, I needed to stop at the Hardware Distillery in Hoodsport, WA to replenish our stock of craft liquor from Washington. My (now late great) buddy out here turned me on to the place several years ago and I’ve (along with Karen a few times) made a point to stop by when I can. With the selected bottles carefully taped to keep the corks from popping on hot days during the ride home, I packed my contraband and chatted with three fellow bikers on a day ride out from the Seattle/Olympia metro area. Then I was back on the bike headed north. Not a lot of passing lanes. Washington, and several other western states, provide short turn-out lanes and rely on the drivers to use them when necessary. Ideally, Mr. Slowpoke is supposed to see the long line of vehicles hugging his rear bumper and realize that they’re holding up the show. They are then supposed to duck into one of these turnout lanes and let the backup of vehicles pass them by. Naturally, for a variety of reasons, it seems that there are a lot of drives what either don’t know about these lanes, don’t think they need to use them (no matter how man miles of cars are lined up behind them), or they think they’re going fast enough that nobody should complain. Being that is was a Sunday, we had plenty of Sunday Drivers who acted like the turnout lanes didn’t exist. Having said that, when you’re riding a motorcycle with 160HP, you can usually find other ways to get clear of traffic. Let’s just say that it was a spirited ride to the ferry. As I’ve documented before, ferry companies love motorcycles. Why? Because the ferry company can charge a motorcycle about half of what they charge a car (which makes the motorcycle rider thing he/she is getting a bargain), and then cram four (sometimes more) motorcycles into the space of one car. We get a break on price, they make more money. In addition, motorcycles can fit into the narrower regions at the front and aft of the ferry, which means even more income for the ferry company. By happy coincidence, this usually means that motorcycles are the first to be loaded on the ferry and, therefore, the first off the ferry. This is important because the first vehicles off the ferry won’t be encumbered with the never-ending stream of vehicles, including several RVs, trucks, etc. leaving the ferry in a long wagon train of frustration. As lucky motorcyclists, who are we to blow against the wind? So, I’m pulling into Port Townsend, WA to catch the ferry to Whidbey Island. As you get close to the ferry dock there’s a special lane to the right to capture all the overflowing line of vehicles that couldn’t fit into the staging area for the next ferry loading. I noted that this lane was almost completely full, probably 80 vehicles or so. In front of my, were two Kawasaki KLR riders and they pulled into the back of the long line of cars. As is customary for motorcyclists in the know, I rode right by them and on to the entrance gate for the ferry staging area. I wasn’t even done paying for my ticket when I saw those two KLR riders in my rear view mirror behind me. We ended up being staged at the front of the pack, where we sat for no more than 90 seconds before they loaded us onto the ferry in front of everybody else. Sometimes the fates of timing throw you a bone. I took a few photos during the ride and tried to figure out where to pick up some lunch before I got in line at the Canadian border. Soon enough, we were docking and all the travelers made their way back to their vehicles to disembark. As usual, the motorcycles were released first (actually, right after the foot passengers). I stopped for some lunch in Oak Harbor. There’s a lot of food options here, from several familiar fast food chains to local establishments. I stopped at the Island Cafe, right off WA20 and had a Monte Cristo sandwich. 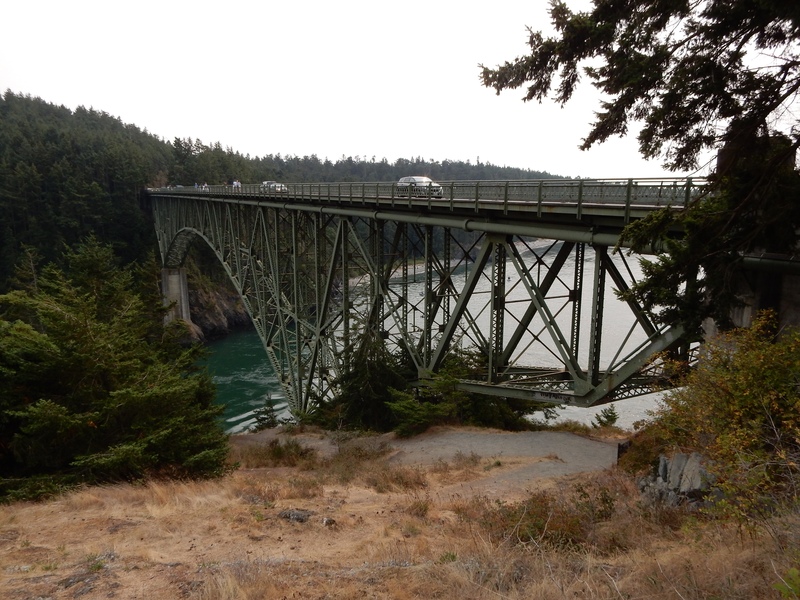 Back on the Nightowl, I was soon looking at a parking spot at Deception Pass, one of the more picturesque spots along this stretch of WA20. I took a few photos of the bridge and surrounding area and continued north. The big crossings near the Peace Arch at the end of I5. The smaller crossing slightly east north of Lynden, WA. Along the I5 there are even helpful programmable signs that tell you what the border wait times are at the different border crossing. The only problem is that you aren’t the only one reading these signs. Consequently, when you’re driving north to the border and you see that the Lynden crossing has a 30 minute lower wait time than the Peace Arch crossing, you naturally elect to take the slightly-out-of-your-way route to save that half-hour. But so is everybody else who saw that sign. By the time you get to the border, the 10 minute wait time is now 40 minutes and any advantage there was in taking the quicker line is now blown away. In spite of my frustration, I did get though the border without being interrogated within an inch of my life or getting the Nightowl disassembled looking for contraband. Surely, the rest of this short day would be smooth sailing, right? Negative. Taking the 20 mile detour east meant I had to come into the Vancouver metro area on Highway 1, which on Sunday afternoons is full of all the Vancouver natives that just spent a pleasant weekend in the mountains. I did eventually make my way towards downtown Vancouver and find my friends’ home, where they welcomed me with food, beverage, and lodging. A relaxing evening ensued. In case you’ve been living in a cave, let me bring you up to date: British Columbia is burning. Heading east from Vancouver through the mountains was going to be a challenge. Luckily, there are live websites in BC for wildfires and road conditions. Using the two in concert with one another, you can verify that a road is still open even though there may be a fire within sight of it. Valuable resources indeed. 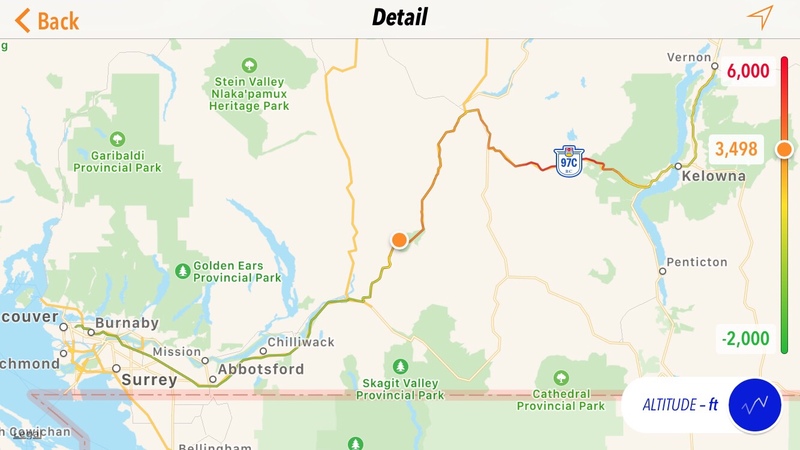 I decided to make for Vernon, BC, stay the night and then plan a further route from there. Since I enjoyed a lazy morning with my friends, which included brunch, I ended up not leaving downtown Vancouver until almost 3pm. Naturally, this meant that the evening rush hour was just getting started. There was a little stop-n-go heading out of town, but not enough to make me start swearing in Latin or anything. As I made my way through the eastern Vancouver suburbs, I notice that my throat was getting a little sore and my eyes were stinging a bit. I attributed this to the pall of smoke that was hanging over everything in the valley. The northeast winds in the middle of the mountains were driving the smoke from the interior of the province down out to sea and down the coast, right into the biggest city in the province. After filling the Nightowl’s tank in Abbotsford, I continued east to Hope, BC, where I turned north on Highway 5 (Yellowhead Highway). This highway climbed into the mountains and the air got clearer almost immediately. The clear air continued when I turned east on BC97 towards Kelowna. As I descended into the lake valley near Kelowna, the air got thicker again but not nearly as debilitating as the smoke back near Vancouver. Heading north from Kelowna to Vernon, you have to claw your way through a set of stoplights in Kelowna that have been programmed to catch you at every light unless you’re willing to annihilate the posted speed limit with extreme prejudice. Eventually, the strip malls and stoplights give way to small lakeshore communities and you can actually make some time. I pulled into Vernon at about 7:30pm, which gave me plenty of time to check into my NAS (notch-above-scuzzy) hotel and select a venue for the evening’s dinner. Mike’s Steakhouse wasn’t very busy this late on a weeknight, so I sat in the bar side of the establishment and shared the large room with only a few other patrons. I had a drink or two, ate my Skookumchuck Chicken Sandwich with gravy fries, and called Karen to let her know I was still alive. Walking out to the Nightowl after dinner, I noticed that the half moon, already high in the sky, was so orange that it was almost red. Usually, you only see that coloring unless you photograph the moon very close to the horizon. Not tonight. 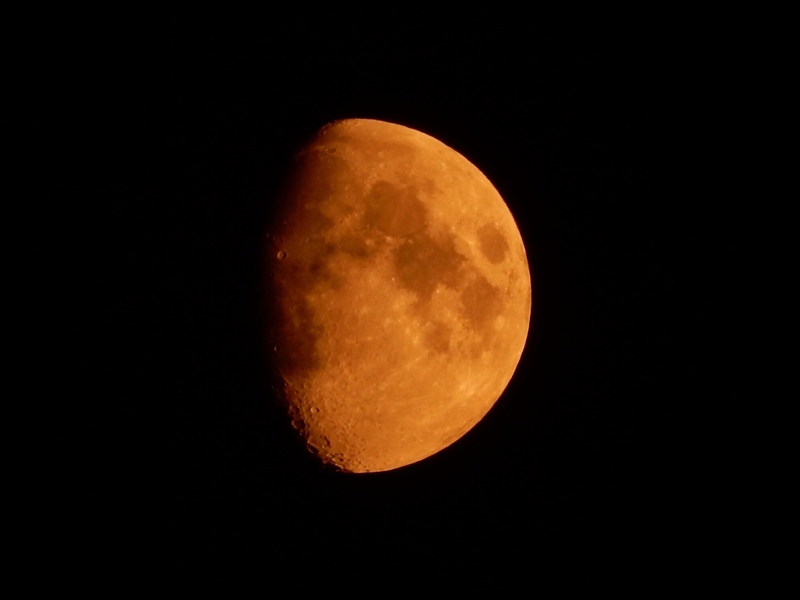 With all the smoke in the air, you got a very orange moon high overhead. Cross a few mountains ranges (hopefully not on fire), ride a few ferries (hopefully still in service), and see if I can get to Alberta without having to don a wet bandana over my nose and mouth to breathe. Here are photos from these two days of travel. 2018 Par-Tay trip day 16 from the Par-Tay to Vancouver. Departing Port Townsend on the Port Townsend/Whidbey Island ferry. The Port Townsend Lighthouse as seen from the Port Townsend/Whidbey Island ferry. 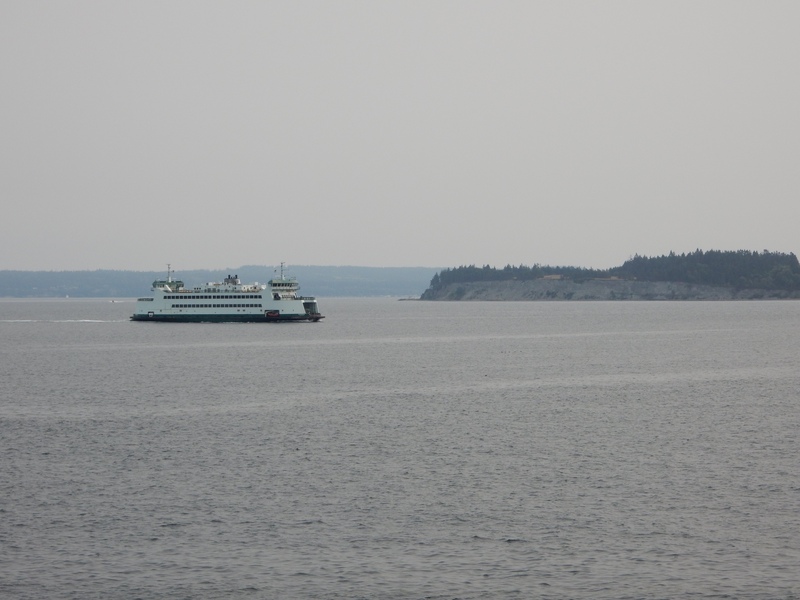 The two Port Townsend/Whidbey Island ferries meet mid-sound during each run. The Deception Pass Beach seen through the girders of the Deception Pass bridge. 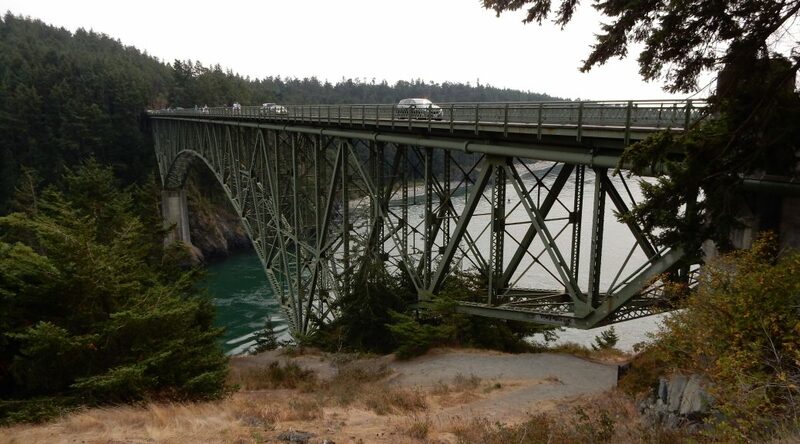 A nice shot of the truss arch bridge over Deception Pass, complete with the swirling current below. The waterway north (east) of Deception Pass. 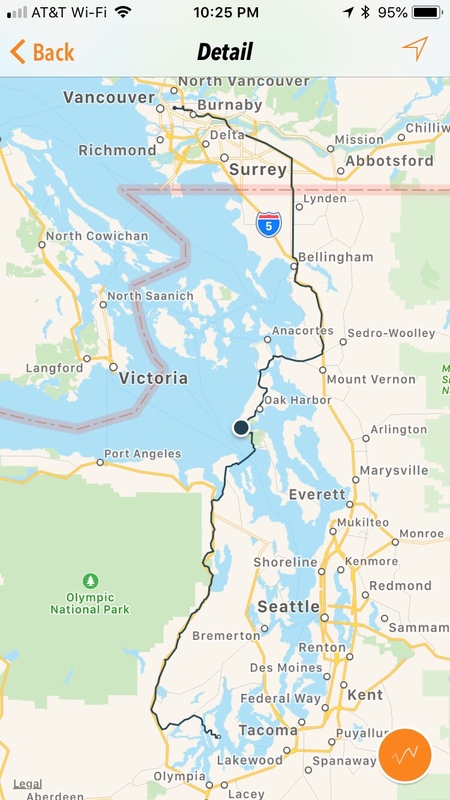 Map of the 2018 Par-Tay trip day 17 from Vancouver to Vernon. 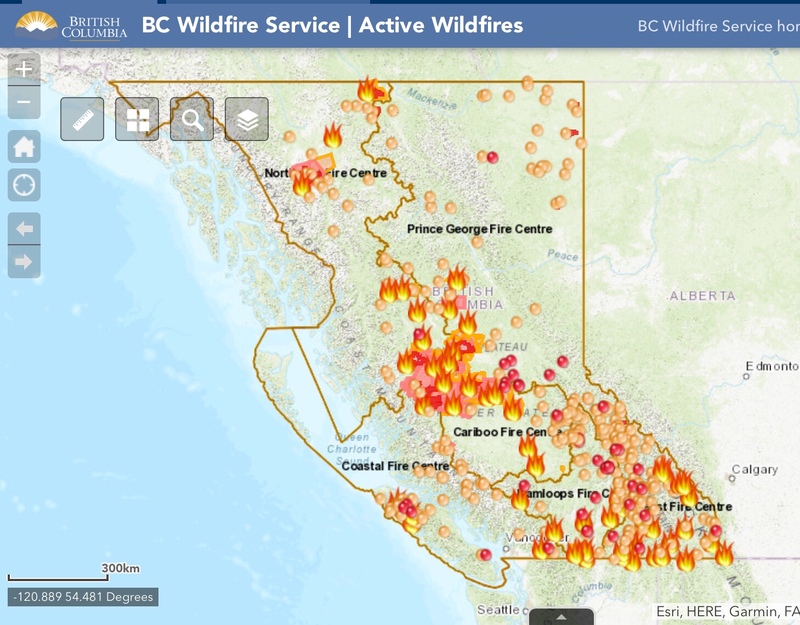 The live British Columbia wildfire map from August 20, 2018. Red moons are usually photographed close to the horizon where the man-made particulates in the air make the moon show red. This moon, however, is high in the sky. The red comes from all the smoke in the air from all the wildfires burning in British Columbia.